After coming back from a week on Cape Cod with my friends and family, I am ready to get back to my writing. I’ve been so busy lately that I wasn’t leaving any time for writing and this is a very bad thing. I’ve got lots of stories, but for this post I want to focus mainly on one particular event. On July 29th, I headed up to Manchester, NH to see psychic medium, John Holland. My friend and I made it our own event, as we always do. Made sure to leave about 3 hours early, load up on the Dunkin Donuts coffee (Coconut flavor for me!) and our books that we wanted to have signed by John. We parked on the first level (yay, we can get out first!) and hit the ladies’ room. All set! When we walked into the ballroom at the hotel, it was already pretty crowded. We learned that there would be 500 people in the audience. With all of the milling around, we took the opportunity to plant ourselves dead center, in the fourth row back. We camped out for about an hour and a half, waiting for the show to start. There was so much energy in the room. At one point I felt like a wall of energy hit me head on and then passed through me. I know there were lots of energy workers there, which also brings up the level of energy simply by being in the same space together. John came up on stage and talked about the basics of mediumship- which I love. On the ride there, I had just been talking about his story about getting a visual of Snow White in her glass casket, which he talks about in his new book, The Spirit Whisperer. This story is such a good example of how spirit communication works because it’s not like a normal conversation with another person. You can get single words, pictures in your mind, and even a song running through your head. All of these are forms of communication, and none of them can be described as conventional! As the readings were happening I was very aware that my grandmother was close by. She was telling me, “you’ll get read.” I kept telling her that I didn’t need to be read. There were so many people there who needed to hear from their loved ones and I was very comfortable just being there to witness it. I sat back, relaxed and let the evening unfold. The second part of the event was the part where John begins to give readings to people in the audience. He prefaced this by telling us that everyone there would receive a message in some way if they were open to the fact that when the spirits come through, they do it in a way that criss-crosses with many people. For example, John could be giving a reading for someone named Henry, whose mother passed from cancer and comes through with a family pet. It’s very likely that someone else in the crowd with the same name could have a mother who died from the same illness also has a dog on the other side. They work in mysterious ways, but they do work with purpose. With this in mind, I got several messages throughout the night. We heard from a woman who was unable to make it to her daughter’s wedding because she passed on just before it happened (my grandmother passed long before my wedding). We heard from another spirit who reminded his parents of going out on a boat together (I had just been out on one days before). And if all of that isn’t enough to make you see my point, there was a reading for someone who mentioned their husband (same name as mine) having trouble with his knee and has been talking about surgery (my husband went through this recently) and had a love of football (he’s a huge football fan). They know what they are doing on the other side, believe me! They know you’re in the crowd, what you came hoping to hear, and they know how to come across so the message is recognized. If you don’t believe me, go to an event like this one and see for yourself. It’s that simple. 🙂 There are no coincidences, there are only synchronicities, and once you realize this you will begin to recognize them as such. They happen all the time. At the end of the event, we stepped into a loosely formed line to get our books signed. 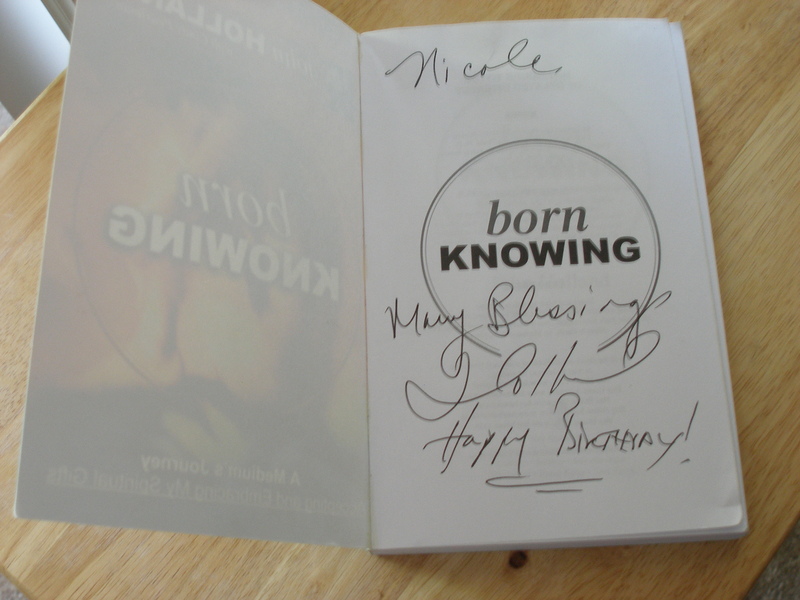 I brought my copy of “Born Knowing,” even though this was the “Spirit Whisperer” tour. It’s my favorite of his books. John opened up the book and began writing. I remember telling him- “I have the new book, but THIS one is my favorite.” He commented back “this is my first book.” And I said, “It’s a good one.” Then with a furrowed brow asked me, “Nicole, when’s your birthday?” I said it was in April. He said, “Because I feel like I need to write Happy Birthday here.” He stopped and with that ‘I’m listening to Spirit’ expression said, “I don’t know if there’s an upcoming birthday, or…” Then I said, “I know what it means,” and smiled. He shook his head and wrote, “Happy Birthday,” and with that I took my book and stepped aside, laughing to myself at how clever my grandmother really is. She knew I would know that it was her, instantly, and that she only had seconds to get this across. What’s really funny is that I know John was in his ‘off’ position after doing over an hour of readings for people, but her energy is just so strong she made it through anyway. She was impossible to ignore in her life here, and it would seem she’s as fiesty as ever on the other side. And yes, I know how very pleased with herself she was that evening to have come through in a new way, especially one that would surprise me. So what’s “Happy Birthday?” This is a reference that goes back to that very first event I went to with my aunt and my mother in Brookline, MA where we met Jackie Waitkus. You can read about the full post here. The short story is, during that first reading, Jackie mentioned that my grandmother was acknowledging a birthday. My mother told me later that she was talking to her earlier and said, “Ma, if you come through, say Happy Birthday to Nicole.” In essence, Happy Birthday was sort of a code phrase. We never set up a word or symbol, but through that experience it became one. I knew in that one moment that I had my reading. I truly didn’t need a reading, and that isn’t why I went to the event, but my grandmother saw an opportunity to do something fun and unexpected. She is amazing. She’s super secretive and sneaky but only because she likes to surprise people. Put it this way, in my family she was probably the only one that could buy Christmas presents and keep them hidden for months without “spilling the beans,” as she used to put it. When she comes to me and asks me to tell my mother she’s around, she always tells me there will be a sign of her presence but never tells me what it will be. At first I thought maybe I just wasn’t getting it, but after her doing this multiple times I know now that it’s intentional. I can still hear her voice in my mind saying, “YOU don’t worry about it. I’ll take care of it.” And she does. So in the words of Frosty the Snowman- Happy Birthday! ~ by healingstarspirit on July 31, 2010.